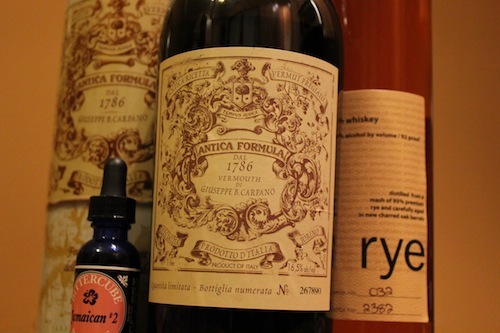 Carpano Antica Formula vermouth: So good it deserves to stand out above the rye in a Manhattan. We aren’t going to tell you how to make the perfect Manhattan. There’s really no such thing and anyone who tells you there’s only one correct way to make a Manhattan (or any popular cocktail for that matter) is probably an assbag. But we do have one piece of advice for making a better Manhattan: use a quality sweet vermouth. Perhaps you already do, but for many years we splurged on the bitters and the rye, but shrugged our shoulders when it came to vermouth. We treated it more like an afterthought, and not like something that constitutes (sometimes) half the cocktail. The man behind the vermouth. But on the front of the bottle's container. At first, the idea of spending more than about $10 on vermouth seemed a little ridiculous to us, mostly because we didn’t think a vermouth that cost more than $10 existed. Such things happen when you rely on the liquor aisles at Dominick’s and Jewel. But then we were introduced to Carpano Antica Formula, a vermouth that costs about $35. It cost about three-and-a-half times what we’d usually spend, but enhanced our Manhattan exponentially (like Manhattann+∞ -ish). 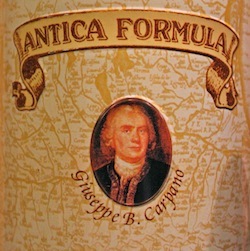 And this makes sense: Carpano Antica uses a recipe from 1786 that comes from Benedetto Carpano, a man credited with inventing vermouth. Upon closer inspection, this vermouth boasts about its “unique vanilla notes,” about its limited production, about its replication of the original bottle and label from 1786. Wonderful things to discuss at a party; wonderful if you want to sound like Paul from “Midnight in Paris.” Personally, when serving it to friends, we prefer to let the taste do the talking. We realize paying $35 for sweet vermouth is a little steep. But we must repeat: if you’ve spent a decent amount on a quality rye, and you like Manhattans, it only makes sense to use a great sweet vermouth. We should also note that if you’re a Negroni drinker, or just like vermouth as an appertif, than Carpano Antica will also make a tremendous addition to your liquor collection. But if you’re like us, you’ll want to try it out in a Manhattan. We usually like ours without cherries. And never again with Gallo sweet vermouth. Carpano Antica Formula ($35) available at House of Glunz – 1206 North Wells Street * Old Town — and Binny’s (choose your location). You can also read about Carpano Antica Formula at www.branca.it or if you can read Italian, at anticaformula.com (warning, this site plays music).